For the second time the Pilsen Fest and El BeiSMan are collaborating with T. G. Masaryk Czech School to put together the Reception Party of Pilsen Fest 2018 and continue the colaboration of the Pilsen Family Encounter project. Pilsen Fest is proud to present Sam Kirk. She created the iconic work of art that will be the Pilsen Fest's face and companion on the 2018 journey. She will also receive the Pilsen Fest award Revueltas for her long career and social commitment. is a cultural worker raised and based in the immigrant community of Pilsen in Chicago. As the oldest son to undocumented immigrants who came from Durango Mexico, Pablo’s creative work has centered on bridging experiences. As an art teacher, Muralist, Painter, DJ, and founder of The People’s Stage Karaoke and Kombi he is constantly thinking about creative ways to bring people together in a historically segregated Chicago. Pablo cultural philosophy is best expressed as “De Aqui Y De Alla” which implies perpetual hybridity and bringing the best around us together. He is currently working on a mural for the main entrance for Farragut High School, hosts Chicago’s best karaoke dance parties every weekend, and alongside his partners at Kombi organizing and producing the next generation of musical experiences for the city. Under the guidance of renowned Czech artist and writer Renáta Fučíková, students from the Ladislav Sutnar School of Design and Art at the University of West Bohemia use illustrations and short texts to trace the history of Plzeň, Czech Republic, from the Stone Age to the present day. At the same time, the young illustrators and graphic designers depict the rise of Pilsen, Chicago — a neighborhood named by Czech immigrants who first settled there in the 1870s, and that today is home to the city’s most prominent Mexican community. This exhibition marks the beginning of a cultural exchange between the two Pilsens — the Czech city and the Chicago neighborhood. It is part of the Pilsen Encounters Project, an ongoing collaboration between the Czech and Mexican communities initiated by El Béisman Libros-Films and T. G. Masaryk Czech School. Also on view will be photographs documenting life in the Pilsen neighborhood, contributed by its past and current residents via the Pilsen Family Album. Learn more at pilsenfamilyalbum.org. 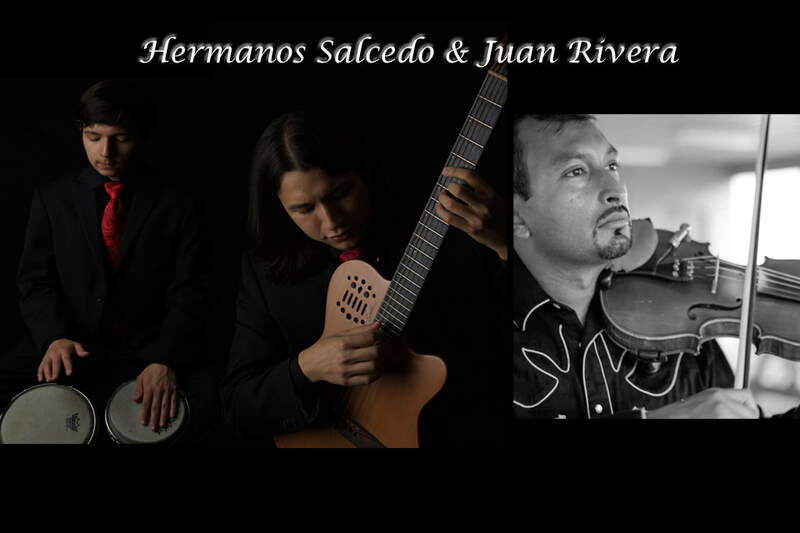 Music by VojoDeyl (Czech Republic) and Hermanos Salcedo with special guest Juan Rivera. Press the link to visit the website of the Pilsen Family Encounter and upload your Pilsen Family Photos. Radim Vojtek and Martin Deyl, long-time friends who performed together in a cymbalom ensemble, founded the VojoDeyl Duo in 2016. The impulse came from a popular Czech singer, Aneta Langerová, who invited Radim and Martin to perform with her on her tour. Radim Vojtek, a graduate of the Jan Deyl Conservatory for the Visually Impaired in Prague with a degree in violin and piano, has been in the public eye since his childhood years. His first achievement came at the age of eleven, when Radim, who was born blind, received the most outstanding talent award from the Czech Radio Foundation at a music festival for blind children. Few years later, the young violinist won the main prize in the Youth and Bohuslav Martinů National Competition. Since 2011 Radim has been performing with the cimbalom ensemble Falešnica. Martin Deyl has been playing guitar and winning music awards since elementary school. During his boyhood years, he also sang and danced in the children’s folk group Hluk. As a singer of the Kosenka brass band, Martin performed at many international festivals. In high school, he founded the band Alterna, which won the regional competition of high school bands in the Zlín district. Martin graduated from the Prague Conservatory where he studied bass and guitar. Currently, Martin teaches guitar at a Music School in Uherské Hradiště. At Pilsen Fest, VojoDeyl will be joined by Karolina Magdalena Kupczyk from Poland. Braulio Salcedo began playing at the age of 7 performing with his siblings, playing percussions such as the cajon, bongos, congas, timbales and the doumbek. He attended the Merit School of Music where he studied drums with Tim Davis and percussions with Doug Brush. While studying there he performed with different ensembles such as the Latin Jazz Band under the direction of Michael Mclaughlin and Victor Garcia, and the Merit Honors Jazz Band Combo under Steve Million. With the latter he performed in venues such as the Chicago Symphony Orchestra Hall and the Chicago Jazz Showcase. Diego Salcedo started his career in Mexico, where he performed in numerous festivals as part of the Jalisco State’s Secretary of Culture Catalogue, including venues in Guadalajara and Mexico City. In Chicago, he has been very active with his flamenco-Latin jazz group, formed by all his siblings, in which he plays electric guitar, bass guitar and flute. He has performed in venues such as the Jay Pritzker Pavilion, Chicago Cultural Center, Mayne Stage and the National Museum of Mexican Art, and Goodman Theater. Mr. Salcedo is also a music educator, currently running community guitar programs in the Chicagoland area. Juan Rivera was born in Aguililla, Michoacán. Both he and his brother developed an interest in music early on and went to Mexico City to pursue their studies at Casa de la Música Mexicana, where Juan later became an instructor. Juan Rivera studied the huasteco style of violin with Rolando “Quecho” Hernández and soon began recording with the group Son del Plueblo including two European tours with the dance troupe Compañia Nacional de Danza Folclórica de México. In Chicago he was part of Sones de Mexico Ensemble, which whom he performed all over the US and was nominated for a Grammy.